It’s all about simple, quick dinners this week. Beardy has abandoned me for a week on a business trip, so I’m cooking for one and really can’t be bothered with anything that’s going to take longer than about 10 minutes…and yes! Shocker! I actually remembered to take a photo!!! 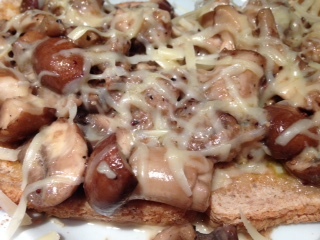 After Beardy, Bear and Boo, Cheese is my next big love (if you’re a follower you’ll know this already), then comes Mushrooms, so what better than a plate of Cheesy Mushrooms on Toast! Not very interesting you might think, but don’t knock it ’til you’ve tried it. Easy peasy lemon squeezy. No measurements, no messing, no mucking – just chucking! Hmmm, might make that my new motto. Basically, fry off the mushrooms in a bit of butter for a few minutes and then chuck everything else in until you have a big gooey cheesy mess of loveliness (did I mention I love cheese? ), pop on top of your toast/bagel/muffin and enjoy! Job done. Yummy in my Tummy. (also yum with some blue cheese in place of the mustard). Smile! At least you’re not a banana!